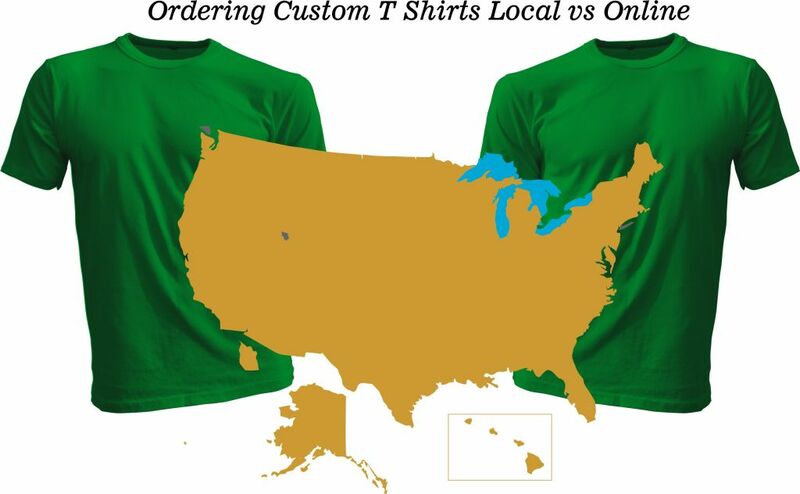 Advantages of buying custom t-shirts local versus online is more than what you might think. I’m guessing most people who read this are not actually that familiar with the custom t-shirt printing process and all of the steps that need to take place from the time the order is placed until the finished product is produced. That’s okay, you don’t need to because this article is geared towards the common custom t-shirt shopper. People tend to buy online because that’s what they know. Generally they buy a lot of things online and it’s just easy. There are two kinds of online custom t-shirt shops out there that offer two completely different experiences when you compare custom t-shirts local versus online. The first online store is geared like any other web based business and that’s to serve customers strictly who buy online. They are bigger businesses yet don’t seem to offer the customer service people crave. You can spot these types of places easily because their who mantra is displaying ship dates. The one major down fall to these types of online custom t-shirt shops aside from customer service is that they never actually see the finished product. They take the order an actually ship there boxes to a printer than is generally in the local vicinity of the order placer. The order is sent to this more centralized printer and printed and then shipped to the customer. So the people you are actually paying for your custom tshirts never actually see your custom t-shirts. So there can be a mystery as to what you are actually getting because you have a printer with one source of quality control and the people you are paying with another. In addition buying custom t-shirts local versus online means you typically pay much more per shirt and while they claim shipping isn’t free, we all know shipping isn’t really free. So at the end of the purchase you end up paying more for your t-shirts then if you chose to buy locally. Now there are companies out there like our company, Kirkwood Trading Company, who are geared toward a local customer base but do ship shirts across the country. This business model is a more cost effective model for the consumer because with these types of smaller companies you are actually paying the company who is doing the printing. You will pay a little more because there are shipping costs but you will drastically save on the price per shirt because the shirts are getting shipped to the company to print and then shipped to the customer. There is no contract printer getting a piece of the pie. You will also experience a faster turn around time. When you buy local the root of that experience is supporting a company that supports the community. Just about all local companies have a design online feature so if you like designing your own shirts that is still an option with a local screen printer. Typically local screen printers are smaller businesses so if you want to show up and talk to someone or pick up the phone and call them you’ll typically get a live voice you can speak with, ask questions to, and get a more personalized experience. Buying locally means you save money because there are no ship charges and again using a local screen printing t-shirt company means they are printing the shirts on site. So the turn around is faster and the customer service and quality control is better as well. The overall experience and buying more cost effective custom t-shirts is the biggest advantage to buying local. So the best part is you have options. Buying custom t-shirts local versus online will save you the most money, give you the fastest turn around time, and the best overall customer experience. So if you are in the market for custom t shirts, look online locally and see what options you have.